Ever noticed how winter’s makes injury recovery feel harder? As if getting hurt in an accident isn’t bad enough, to add insult to that injury, the cold winter weather makes everything even more complicated. Spending time out of doors, getting around with mobility issues, staying active and healthy… all challenges enough when you’re dealing with an injury, but even more so when you have to factor in the weather. The key to managing chronic pain or an ongoing injury, despite the cold weather, is to stay active, stay warm and healthy. A horrible head cold, or worse – the flu, makes going to therapy more difficult and can slow down your recovery time. It’s vital to make sure that you eat well, sleep enough and keep germs at bay. After all, Christmas is the season of giving, but the thing that a lot of people seem to want to give away is their colds! This is also a good time to make sure that your home is clean, furnace filters have been changed and everyone gets into the habit of wiping down surfaces to stop the spread of viruses. One person coming into your home with an active cold virus can spread it to a lot of surfaces (think door knobs, handles and more), which can easily make it over to you. Your immune system is already busy with injuries to your body, helping you to heal. It doesn’t need the extra hit of a head cold. Maintaining an exercise routine as prescribed by your doctor gets harder when you can’t go outside; even a walk around the block can become an issue. It’s vital, however, that you maintain good circulation and muscle tone while you recover, so you need to talk to your doctor or therapist about exercises that you can do indoors. They can recommend options that will suit your injury, without making things worse. If going to the gym isn’t in your program, one good option is to get to a mall and do some walking. The warm environment and low slip risk flooring makes it a good alternative to an outdoor walk, when the weather won’t cooperate. I admit that will power is a bit of an issue so keep the credit cards at home if you must! Swimming is also a good choice for many, as it is low impact but great for muscle tone. Most communities in Ontario have indoor pools (check your local YMCA or rec centre) with monthly memberships that won’t break the bank. Just remember to take it easy when walking on icy pavement or getting around in the snow. You don’t want to slow your recovery by exacerbating your injuries, or worse, adding to them. Even if you’re mobile, leave the shovelling to someone else and take extra care on snowy stairs and walkways. In the cold winter months, muscles can seize up a lot more, making therapy and general life a little more painful. This is a good time to invest in some alternative therapies, like massage, to keep your muscles limber and warm, ready to tackle anything. Another option, provided you’ve checked carefully with your doctor and therapists and they agree, is to try out yoga. I’m not referring to standing on your head yoga, but a 45 minute yin yoga program a few times a week is a grentle way to keep your body limber while at home. Gaia.com offers a wealth of streaming yoga videos for about ten dollars a month. If your doctor agrees, this could be a great way to be active without braving the snow and ice or breaking the bank for those living on a reduced income. Winter can be a difficult time of year for people who struggle with their mental health. Beyond the holiday glee of December, the weather doesn’t usually boost most spirits. Add an injury and you could be at risk for depression. Mental illness issues are just as important as your physical injuries because they can impact the effectiveness of your recovery. Take the time to speak to your doctor if you’re feeling the effects of the season, or your injuries, in terms of your overall mood and wellbeing. Recovering from an accident related injury requires effort: mental, physical, financial… If you have any questions about how you will cope with your injuries or what your next steps might be, your best bet is to consult with your doctor and remember to tell your personal injury lawyer. We are not doctors, and can’t advise you on the medical front, but remember we’re helping a lot of people in your situation so we can often point you in the right direction. Can You Sue Your Neighbour And Stay Friends? 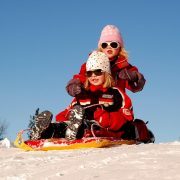 Tobogganing Ban in Ontario Cities? It’s a Downhill Slope….